Ficus carica is known by the Egyptians as the 'Tree of Life' and is an Asian species of flowering plants in the mulberry family. 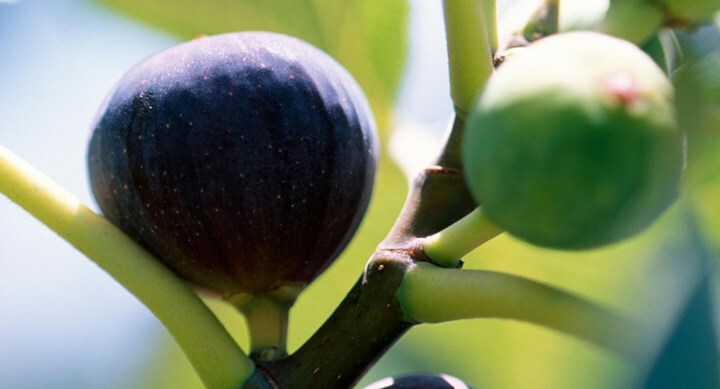 Simply known as 'fig' it is native to the Middle East and western Asia and it has been sought out and cultivated since ancient times and is now grown extensively throughout the world both for its delicious fruit and as a wonderful ornamental plant. The fig is a large, deciduous, well shaped tree and is excellent as a shade tree and can be trimmed and trained into a manageable size, grown even as a hedge or espaliered in tight situations, they can also be grown in large pots. 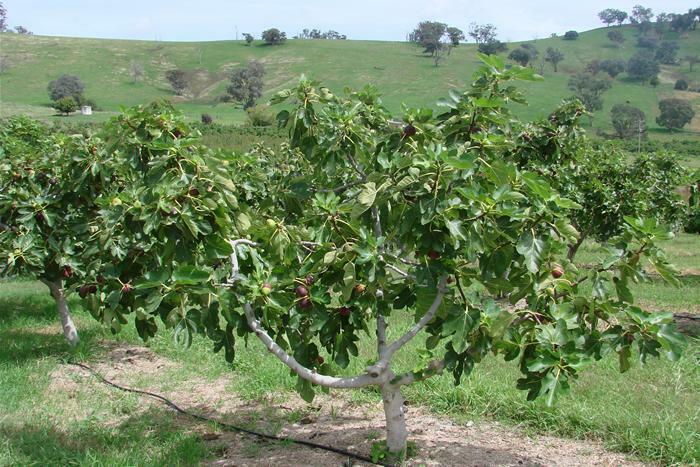 Figs prefer a Mediterranean climate - warm to hot summers and cooler winters, rather than wet humid coastal Coffs Coast. Having said that, there are still plenty of dedicated backyard fig growers enjoying good crops on the coast which makes their efforts even more worthwhile. Take for example this excellent fig grown at President Sue's garden at Corindi (leading photo). So if you are one who likes a challenge, it looks like the fig just might be a goer for you. 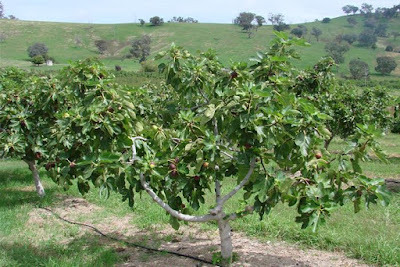 Many fig tree varieties crop twice each year - the first is called breba (or breva in Spanish) which develops in the spring on the previous year's shoot growth. You can often see the tiny fruits dormant on the tree over winter. Sometimes these figs don't always develop the rich flavour of the main crop so some people like to remove the breba so the tree's energy is given to the main crop. In really cold areas these breba figs often get burnt by severe frost - certainly not the case for the Coffs Coast! The main crop develops on the current year's shoot growth in late summer in the leaf axil. An interesting fact about figs is that they flower on the inside - the pulp inside the fig fruit is actually lots of tiny little flowers. Many figs require a wasp to pollinate the flowers through the small white eye on the end of the fruit, so think very carefully before using chemicals and traps in your backyard that may harm these wasps. Having said that though, most commercially available varieties of figs these days are self fertile. Figs require good drainage as they hate 'wet feet' and are often planted in raised beds or mounds to ensure good drainage. As a test to see if drainage is good enough for a fig, dig a deep hole and fill it with water and if the water drains away within 30 minutes you are good to plant in that position. They do like a limey soil, so if your pH is below 6.5, you'll have to dig in some lime to correct the pH. Choose a site that has good early morning sun - the sun will dry off dew which will reduce the incidence of disease. A good layer of straw mulch and plenty of organic matter will also give your tree an excellent start. Also another consideration for choosing your site for planting is to remember that this tree will be a lovely shade tree to loll under on hot summer days! If room is an issue, fig trees will happily grow in a pot or a small contained garden bed (this can be raised to assist with the drainage). Unlike most plants, restricting the spread of their roots encourages fig trees to be more fruitful and needless to say will also limit their actual tree size. Fig mosaic virus - this is a serious problem and affects leaf pigment and causes a mottled, yellow pattern on the leaf. The yellow spots sometimes become surrounded by rust coloured borders as the disease progresses. Affected plants need to be destroyed as there is no effective treatment for this virus. Queensland fruit fly (Dacus tryoni) - is a major pest in many areas of NSW. Small, brown/black flies with distinctive cream to yellow markings on the mid-section, the female lays eggs in ripening fruit which then spoils. Pheromone traps will attract and kill the male fly. Fallen fruit should be destroyed. Fig blister mite (Aceria ficus) - colourless to white, blister mites attack inside the fruit leaving rust coloured dry patches that affect the eating quality of the fruit. You won't know they are there until you harvest the first fruits. If you do find damaged fruit, destroy it to prevent subsequent fruits being infected as they ripen. 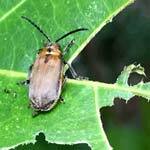 Fig tree leaf beetle (Poneridia semipullata) - Both larvae and adult can cause damage to the leaves. 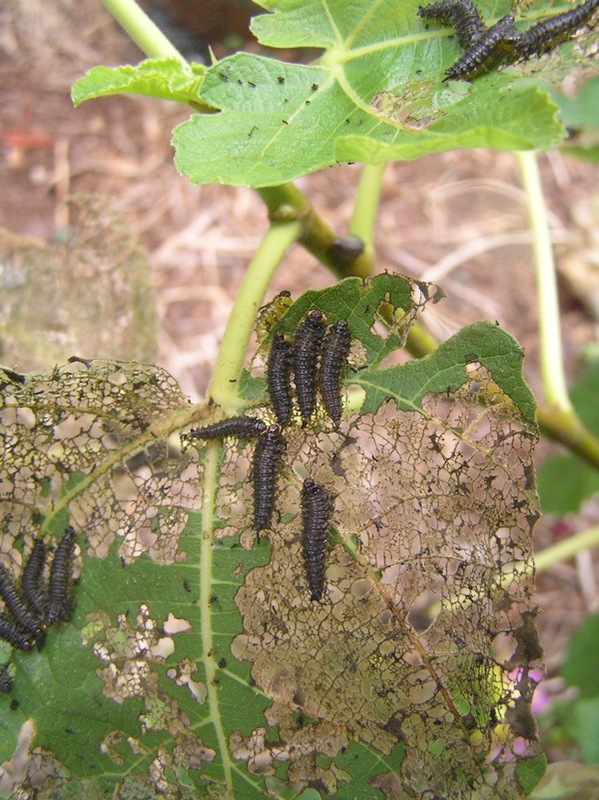 The larvae are responsible for most of the damage on new leaves and when they feed in groups (as they often do), they can destroy the new growth very quickly. The adult beetles are about 10mm in length, brown in colour with a black dot on the thorax and the base of the wing covers. The adults tend to be more solitary and eat the edges of both new and old leaves leaving a scalloped pattern to the leaves. The fig leaf beetle caterpillar chews and skeletonises the leaves. These guys have a voracious appetite and if you're not on to them quickly they can clean up every leaf on the a small tree in a few days. Regular checks once or twice a week will keep numbers down. If you do see them, squish them immediately, spray them with a natural pyrethrum spray or knock them into a bucket of water which has some washing up detergent in it. Fig rust and Anthracnose - both fungal diseases that may affect fig trees here on the Coffs Coast, fig rust produces powdery yellow spots on the leaves. Anthracnose forms small brown to black spots, which develop into a larger patch of infection. With both diseases, leaves will turn yellow and then fall. As with most fungal disease, copper-based fungicides are normally used for control and fallen foliage should be destroyed. If your newly planted tree has a single stem this should be pruned at about 60cm and then three developing branches selected to form the initial framework. These developing branches should later be shortened back to allow for further branches to develop. This will enable a strong framework to be established in your tree. To encourage a good crop on vigorous new wood the annual growth should be cut back to about a third of its length each winter. Dead and diseased wood should of course, be removed. When harvesting allow the fruit to ripen on the tree, they will be slightly soft to the touch and smell sweet. Figs will not continue to ripen once they have been removed from the tree. As they bruise very easily, handle them with care when picking. 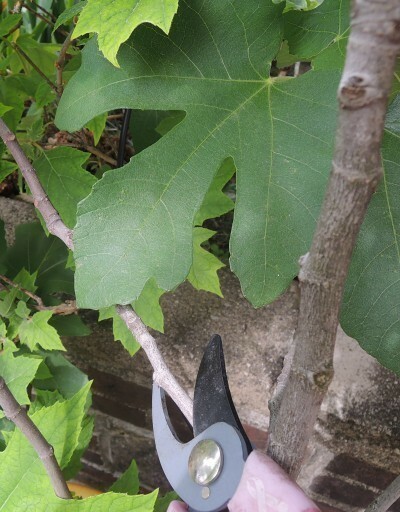 A fig tree will usually start to bear fruit from 2 to 3 years after planting. Figs are a very versatile fruit and can be eaten fresh, glazed, dried, poached, slow roasted etc etc. They are high in fibre and vitamin C and the sap of fig is reportedly useful in getting rid of warts..... (Some people can have an allergic reaction to the latex so caution should be exercised, use gloves and long sleeves when harvesting). You can see more about figs from this excellent site http://www.foodforest.com.au/. The Food Forest is based in Gawler South Australia so a very different climatic condition from the ours here on the Coffs Coast. However, there is a lot of detail about fig varieties on their website and other interesting information. Thanks Sue. Would like to find room for a small one. Any good ideas about protecting them from birds,specially magpies? Method Two - place large hoops over your tree (using poly pipe) net, and secure the netting to the ground. Method Three - is to cover each fruit with foil...... not sure how this affects the developing fruit? Method Four - use organza bags (like the ones used for wedding sugared almonds favours) and tie these over individual figs, one would assume that you wouldn't want to have a HUGE tree with massive amounts of fruit with this method! Netting is not working for me, that's why I asked.